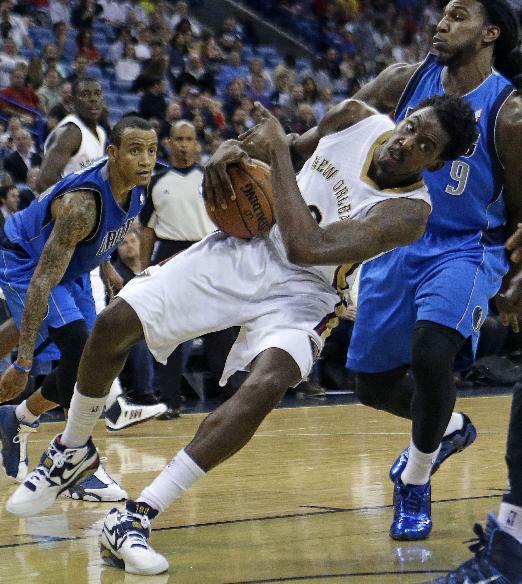 The Sneaky Fantasy Basketball Pickups for Wednesday, December 4 is Al-Farouq Aminu. He’s owned in 11% of Yahoo! Leagues and 0.3% of ESPN Leagues. Two games into the 4-6 weeks that Anthony Davis is expected to miss with a fractured hand, it seems that both Aminu and Jason Smith will have value replacing Davis’s production in the starting line-up. Smith has also been solid in the last two games, so why Aminu? Upside. Lots and lots of upside. A 16-21-1-3-0 line is insane for a guy who hasn’t scored that many points or grabbed even half that many boards in any other game this year, though interestingly enough Aminu posted a very similar 16-20-1-0-1 line against this exact same team last season. He has that ability. If you’re looking for upside guy to grab and stash on your bench, he’s a worthy pickup. Over the two games that Davis has missed so far, Aminu has averaged 15.0 pts, 15.0 reb and 3.0 stl on 51.9% FG and 25.0% FT. The rebounds are obviously fluky due to last night’s game, but these numbers do accurately reflect two of his notable trends all year: great steals (1.4 in 22 mpg) and awful free-throw shooting (48.1% on 1.6 FTA). However, the FT% is far and away below the 75.4% he was averaging in his career before this season, so expect that to regress back up to the mean. Ultimately this sample size is far too small to predict anything for Aminu yet, unlike Smith who has been the Pelican’s starting center for a while now. At the very least, he’ll get you steals and a decent number of rebounds even in limited minutes, though what he could get you is much higher. Other Notable Players: The other half of the tandem replacing Davis, Jason Smith, has averaged 12.0 pts and 11.5 reb in the past two, though it should also be noted that he also had a fluky game where he played 47 min in a triple-overtime affair. Smith’s value has obviously increased, and I also expect his numbers to be more secure than Aminu’s. If you wanted to pick up a guy to play right away, Smith will cause fewer headaches, unless Aminu explodes of course…DeJuan Blair started and played a season-high 29 min tonight. His contributions weren’t notable, but this change might stick as Samuel Dalembert neither injured nor late for practice but still only played 19 min off the bench…Gerald Green was much better in his last stint playing behind both Eric Bledsoe and Goran Dragic. P.J. Tucker did keep Green on the bench more than usual by playing well, but you shouldn’t hold on to Green too long anymore if you’re eyeing a better choice in your free agent pool…The Rockets rotation got very short tonight with Chandler Parsons, Jeremy Lin and Omer Asik all sitting. That does not explain why Terrence Jones only got 23 min, the second game in a row in which he played limited minutes while Omri Casspi got over 30. Jones has played too well recently to assume this will continue, but it’s a troubling situation for Jones owners and potentially rewarding situation for owners who could use a versatile forward like Casspi…At the same time, Aaron Brooks has now averaged 11.8 pts, 2.3 reb, 4.8 ast, 2.3 stl and 1.8 3pm in the four games that Lin has sat out so far. Sadly, Patrick Beverley isn’t any more valuable than Brooks is (9.0 pts, 5.8 reb, 3.0 ast, 1.8 stl, 1.5 3pm) despite averaging almost 10 more min per game. Though Beverley does commit significantly fewer turnovers (0.5 vs. 2.0 per game)…The Bucks spread the love wide with nine players topping 19 min but only Ersan Ilyasova topping 30. The one notable aspect was coach Larry Drew playing Luke Ridnour (10-3-8-3-0) 28 min over just 19 for Brandon Knight (12-1-3), who played poorly despite having three straight productive games previously. I don’t expect that switch to stick, but Drew has been known to be erratic with his rotations…Some other bullet points from that game since it seems like everyone did something: Ekpe Udoh blocked six shots, Khris Middleton hit four threes on 83% from the field, Giannis Antetokounmpo posted a 6-6-4-1-3…Marvin Williams missed tonight’s game with inflammation in his Achilles, allowing Enes Kanter to get the start and a shot at playing his way back into the rotation. Against a tough Pacers frontline, Kanter was fantastic, dropping a 20-10 in 40 min. That is not good news for Williams. The Jazz want to develop Kanter, and Williams may have just lost his starting job. Despite good to graet games from our current top three, all of their ownership percentages only went up by one point each. That means we get to keep Bass on this list just a little longer. Meanwhile, Kanter’s resurgence makes Williams a shakier bet to continue logging 30+ min. Hindsight: Yesterday’s Pickup Timofey Mozgov failed to establish himself as the superior center over J.J. Hickson last night despite both Andrew Bynum and Anderson Varejao having their way with Hickson. This was the ideal matchup for Mozgov to prove his value, and the fact that he didn’t deliver makes his long-term value shaky again…Another former Pickup, John Henson, fared a lot better, posting 12-9-2-2-3 in 29 and a half minutes. This entry was posted in Fantasy Basketball, NBA and tagged aaron brooks, al-farouq, al-farouq aminu, alphabet, aminu, ant davis, antetokounm, anthony davis, basketball, brandon knight, chandler parsons, dejuan blair, ekpe udoh, enes kanter, eric bledsoe, ersan ilyasova, fantasy basketball, fantasy hoops, fantasy sports, gerald green, giannis, giannis antetokounmpo, glen davis, goran dragic, j.j. hickson, jason smith, jeremy lin, khris middleton, kosta koufos, larry drew, luke ridnour, marvin williams, nba, new orleans, new orleans pelicans, nola, omer asik, omri casspi, p.j. tucker, patrick beverley, pelicans, pellies, samuel dalembert, terrence jones, the brow, timofey mozgov, waiver wire, wesley johnson by Chendaddy. Bookmark the permalink.